This page was made using HEAT! I used two different embossing techniques: a stencil-resist technique to create texture and interest on the background, and a “chalkboard” technique (using a special type of embossing powder and real chalk) on black paper to create the “Smile” add-on. I used my new melting pot with beeswax to create the three smaller tags, and my melting pot with Utee (Ultra Thick Embossing Enamel) to create the large tag, the glass slide, the metalized butterfly, the faux wax seal, and the embossed text. 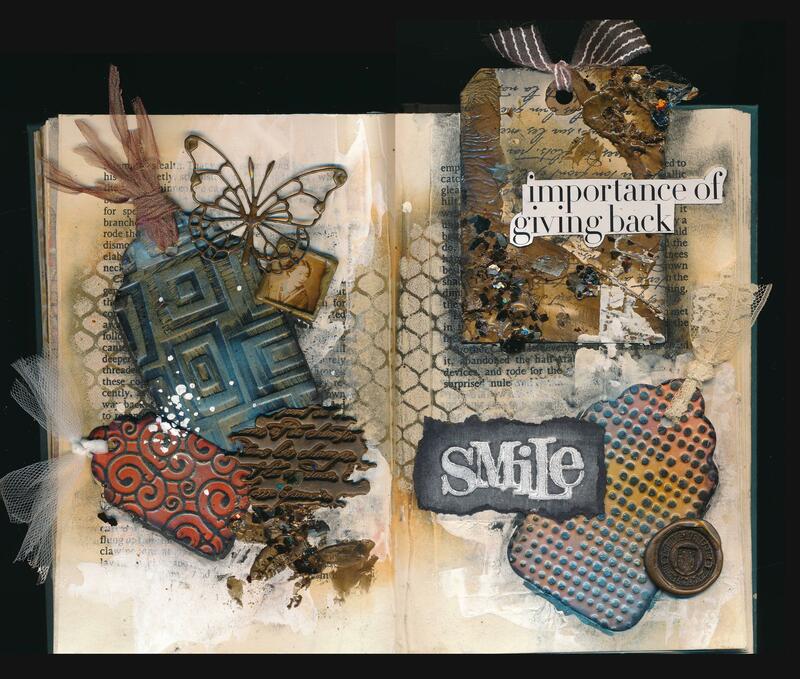 Other materials used include: embossing plates, perfect pearls, glass slide, Archival ink, Distress Inks with blending tools, chalk, fibers, mica fragments, acrylic paint. Contact me if you’re interested in taking this class from me so we can schedule a group session at your home, or a one-on-one class in my home. Click on the image to enlarge it and see more detail. The pages look lovely. I have never seen beeswax used in this way. I have a melting pot and have used UTEE, but not beeswax. Sadly I live in the UK, and wouldn’t be able to come to a class, but I am definitely intrigued by the techniques! Thank you, RainbowFingerCrafter. Beeswax melts at a lower temperature than Utee, so I had to set the temperature to 240 (instead of all the way on high, like I do for Utee). My only regret is that I wish I owned a couple of extra project pans so I didn’t have to clean my melting pot between projects! They’re on my “wish list” the next time I see them for a good price. Is it more flexible than UTEE? Yes, I think it is. But it’s very different than Utee, so I think it’s fun to have the option of using either one. Beeswax smells wonderful when it’s melted (makes the house smell good!) whereas Utee stinks. Beeswax is a tiny bit “sticky” when cooled — so it holds onto Perfect Pearls beautifully — whereas Utee is smooth. Beeswax has a slightly cloudy look whereas Utee is clear or coloured. Beeswax can crack if it’s thick enough, but a thin layer seems to be quite flexible. So I think the two products are both fun to play with in different ways. Hmmm I might have to have a go with beeswax then! I have wax for using with seals on envelopes, but I haven’t tried putting it in my melting pot, not sure whether it’s beeswax or not though! Beeswax is very different from candle wax (which is probably what your sealing wax is). Beeswax is more flexible and more “sticky” than candle wax — and it smells different when you melt it. Beeswax adheres well (whereas candle wax will break away from paper). So if you’re going to try beeswax, make sure it’s REAL beeswax. I’ve seen it for sale in craft stores in several formats: in a big brick (either “natural” coloured, which has a golden colour like honey, or “clear” which is an off-white colour), and in small pellets packaged in a cylindrical container. Any of these options are fine as long as it’s 100% beeswax. As soon as you start heating it in the Melting Pot, your whole room starts to smell like honey cookies! It’s wonderful. I love to breathe in the smell.